Long plant downtimes now belong to the past. The new JUMO temperature and pressure sensors with IO-Link use the integrated diagnostic function to better plan the availability or the exchange of sensors. In addition, time-consuming parameterizations when changing sensors are eliminated as the necessary data is transferred from the superordinate system. Flexibility, production process optimization, and remote serviceability are important performance parameters for machines or plants. Sensors with IO-Link now give the plant operator access to the lowest field level. Only minimal effort is required to retrieve sensor information, parameterization, and diagnoses so that plant conditions can be ideally evaluated. The efficient point-to-point communication of IO-Link is based on the well-known three-wire sensor connection that does not place additional demands on the cable material. 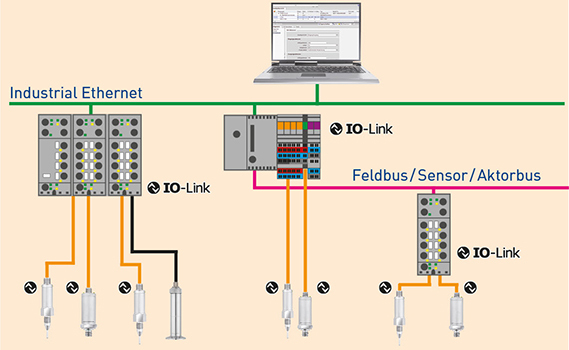 IO-Link is consequently not a fieldbus, but the further development of the previous and proven connection technology for sensors. IO-Link is a serial, bidirectional point-to-point connection for signal transmission and energy supply within any number of networks, fieldbuses, or back panel buses. The use of sensors with IO-Link can significantly reduce the required effort for mounting and startup. This advantage is made possible through simplified cabling as well as automation of the startup through parameter storage and duplication. During mounting, ready-to-install cables are used so that no assembly is required and error sources are omitted. Startup is also possible through automation as the parameters can be downloaded and made available to the device in a matter of seconds. Users particularly appreciate IO-Link due to its simple installation and parameterization as well as its independence from the fieldbus. The result is that the need for wiring is significantly decreased and that each sensor always has its own “ID card” due to consistent parameter data retention. This greatly reduces the amount of work involved in troubleshooting. Times of unexpected plant failures due to a sensor defect are over. The reason here is that the integrated diagnostic mechanisms allow early recognition and repair of defective sensor states. The functions contained in the sensors – such as operating hours counter, drag indicator, and detection of probe breaks/short-circuits – help to evaluate the sensor states early enough to react so that plant efficiency increases considerably. IO-Link offers the option of exchanging cyclical as well as acyclic data with superordinate levels. For example, parameter data can be downloaded to a sensor or, alternatively, diagnostic data can be extracted during operation. Due to a transmission speed COM 3 with 230.4 kBaud and the cycle time of 2 ms data is quickly exchanged and available within seconds. IO-Link closes the communication gap between the field level and the sensor level. As a result, other than the process variables, data for identification, for parameterization, and about the condition of the device can be transferred. Now information is available that prevents the mix-up with wrong device types during device exchange. The parameterization of the sensors is saved in a superimposed fashion so that it can be automatically transferred during device exchange. Each IO-Link devices includes a device ID. The IO-Link master retrieves the device ID and can assign the device to an IODD. This offers the option to distinguish the sensor type (temperature sensor/pressure sensor) from other ones through the device id as each sensor type possesses several device IDs. These clearly identify the sensor and describe its different features. One result is that the exchange of a sensor with another that deviates in the measuring range and accuracy class can be identified immediately. The wrongly mounted sensor is instantly replaced by the correct one and is not even implemented, which prevents its destruction or an error during running operation of the plant.